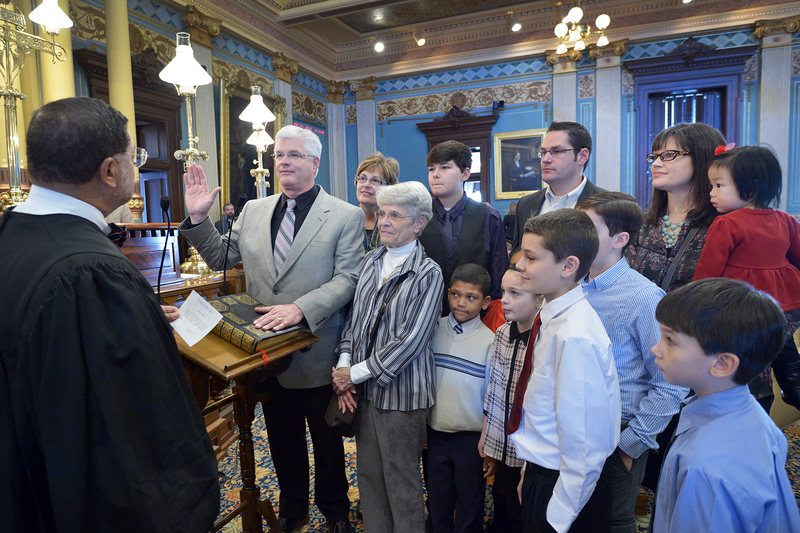 LANSING, Mich.—State Sen. Mike Shirkey was sworn in as senator of the 16th District on Wednesday during a ceremony at the state Capitol. Michigan Supreme Court Chief Justice Robert P. Young, Jr. administered the oath of office. Shirkey was joined on the Senate floor by his wife, mother, and several children and grandchildren. Shirkey also announced that his office is open and ready to assist constituents of the 16th District. An email address and toll-free phone number have been established to add convenience for district residents. The email address is SenMShirkey@senate.michigan.gov and the toll-free number is 1-855-347-8016. Shirkey’s office is located in Room 320 of the Farnum Building at 125 West Allegan St. in Lansing, across the street from the Michigan Capitol. For U.S. mail, the mailing address is Senator Mike Shirkey, P.O. Box 30036, Lansing, MI, 48909. Residents can also visit his Senate website at SenatorMikeShirkey.com for information on legislation, to see photos and to access helpful materials. Note: For a print-quality version of the photo above, click the image or click Photowire under the Media Center tab, above.